Use QIOS Pelican to send personalized e-mail using several datasources. With QIOS Pelican you send all your customers, colleagues, friends, employees, club members or another group of people the same e-mail, but with personalized content. 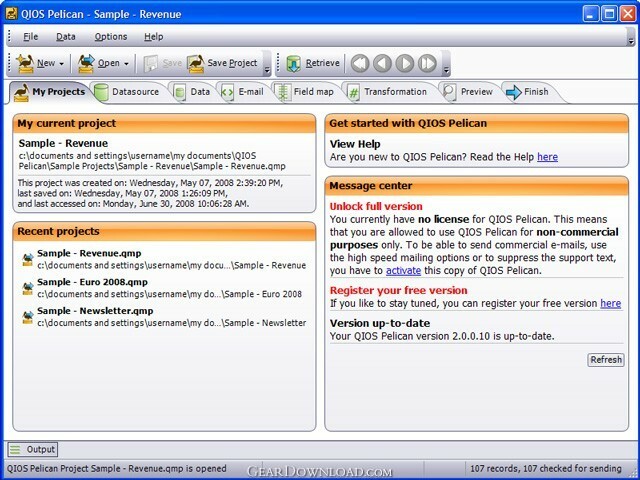 To send this personalized, bulk or mass e-mail QIOS Pelican uses two basic elements for its job: A Datasource and an E-mail. The datasource contains the information about the group of people you want to send an e-mail. It contains a list with the e-mail addresses of the recipients, their names and all kind of other specific information. It can reside in Microsoft SQL Server, Exchange, Access, Outlook, Excel, Oracle, MySQL, Text file or even in a Custom OLE DB or ODBC Source. The e-mail contains your actual text message and the fields that will be replaced on a recipient's basis. Between having a list of people with additional data and sending the actual e-mail, there are just a few steps involved. To execute these steps QIOS Pelican has a clean an nicely tabbed user interface. This download (qpelicansetup3.0.1.0.msi) was tested thoroughly and was found 100% clean. Click "Report Spyware" link on the top if you found this software contains any form of malware, including but not limited to: spyware, viruses, trojans and backdoors.